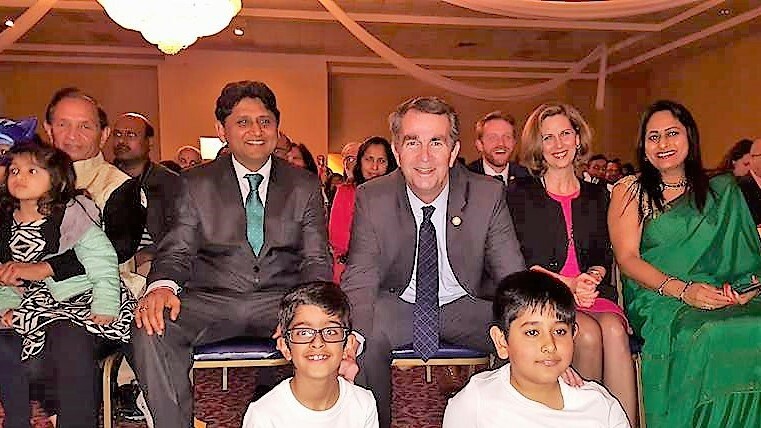 Addressing a large gathering of people of Indian origin and Indophiles at the Cultural Center of India, Virginia [CCIVA], recently elected Governor of the Commonwealth of Virginia Ralph Northam said, “We are proud of our inclusive culture. We have welcomed everyone to the Commonwealth and we will continue do so.” The occasion was the celebration of the 69th Republic Day of India at CCIVA. While it is a national event with a massive display of patriotic fervor in India, people of Indian origin the world over mark the coming into effect the Indian Constitution in the aftermath of the independence of India. “It is the diversity of the Commonwealth that defines us,” said Governor Northam, adding, “The contribution of the Indian community to our success is significant. We hope to build on this.” The Governor along with his wife Pamela Northam watched colorful dances representing the geographic and cultural diversity of India. Hundreds of Virginians gathered on the surprisingly warm January evening draped in eye-catching costumes. The mood was clearly festive. “We belong here to this great Commonwealth, but we are deeply tied to our roots as well. We try and nurture this dual sense of belongingness including in the next generation. This is in full display at the performances put on by this incredible group of young people,” said Sanjay Mittal, President of the Cultural Center of India. This display of passion and leadership was evident from the many active members in the committee who went on stage at the start of the evening. Dignitaries present at the celebration included Commonwealth Attorney Shannon Taylor, Delegate Schuyler VanValkenburg from VA’s 72nd district, and Satya Prakash from State Bank of India, Washington DC. The Cultural Center of India has a rich history promoting arts, culture and responsible citizenship. The Trustees of the Center who have been the driving force behind its activities were in attendance. “The community space we have created has become a magnet for talent, promoting diversity and deepening our bi-cultural identity,” said Mr. Pramod Amin, Chairman of the Board of Trustees. “We use every occasion to come together and feel this sense of community,” said Yogesh Gandhi, an active member of the community. “I have been proudly associated with a range of activities over the years. But it is really nice to see how the newer generation of leaders are owning this effort and taking it to new heights”. “We want to not only increase the number of activities we take up in 2018, we also want to usher in innovative ideas and concepts to foster the creative talents of our younger generation. Everyone should feel that they have a space to express themselves and grow as part of this community effort,” expressed Sanjay Mital as he laid out the vision for the activities of the Cultural Center of India in the year 2018. Meenakshi Nandwani, Cultural Director of the event, also thanked everyone involved. “I thank all the performers, parents, choreographers, volunteers, the honorable governor, the first lady and over 550 community members for joining us at the 69th Republic day of India celebrations,” she said.